The cutest of kitties is ready for the catwalk! With a simple snap of a clasp, girls can personalize their CHARM IT! jewelry. 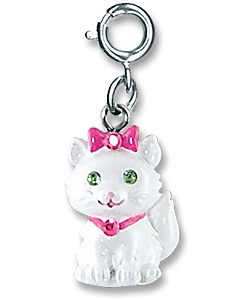 With white enamel "fur," sparkly green acrylic stone eyes, and a pretty pink bow and collar complete with sparkly pink acrylic stones of their own, this 3-dimensional CHARM IT! 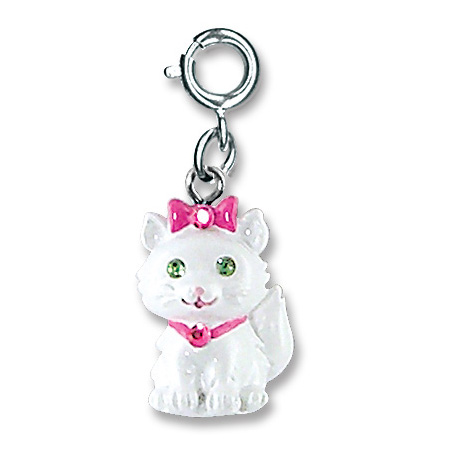 kitten charm is a sure hit with the cat lover in your life. This adorable Tangled Cat has a huggable body of soft light gray fur and holds a plush red present in her paws.